Preserve your memories, they're all that's left you..."
...in the sand at the BEACH. I loved the ANTICIPATION of what I might FIND. * the junk mail used in this piece were the words: MEMORIES and DO NOT DISCARD. I painted some 140-pound index paper, then stamped with gesso, applied more acrylics and buffed with an old rag...I then randomly tore pieces and adhered them to my pages to create my 'layers of memories'. You know what I love to do? 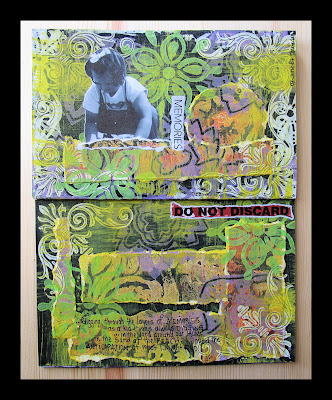 I love to enlarge the images of your journal pages. I can see each and every detail. You look to be a tidy and intricate scissor manipulator. I love that!! If I told you what I use to cut for my collages, you wouldn't believe me!! garden painter art Kim...well, truth be told..I don't use scissors :) for the junk mail I usually just tear it...for images like the photo of myself in this one I use an X-acto knife. Now come on...tell me...what do you use when cutting pieces for your collages?!?! Well.....let's just say, it's a garden tool!! garden painter art....THAT explains your name!!!!!! Yes, that's part of my name. The other part is that I always use an image of my garden in each and every one of my collages. Most of the time it's hidden. But, this blog is about your art, and your art is amazing. I love the cultural flair and the very personal feeling of your journal pages. Two big thumbs up!! Love it as usual. Mija Jolene, I absolutely LOVE the way your colors POP against the black background! And that picture of you as a little one is too cute. Thanks for inspiring me! On color, not another child. LOL!!! cre8tiva - I am so glad you enjoy your visits here! Mija Linda...what? You don't want another child?!?!?! LOL!!!!! Do You Hear What I Hear, Here ;-) ?